Explore the marvelous City of Rio de Janerio. Visit Rio de Janeiro City, World largest Urban Forest, Museums of Rio de janeiro. Arrive Rio de Janeiro 7 Nights & Leave. Overnight Stay at the Hotel in Rio de Janeiro . In the evening Samba Show with dinner: A spectacular samba show with singers and dancers in elaborate costumes who present Brazil’s rich folkloric traditions and capture the famous rhythms of Carnaval. Dinner is included. stops at the Chinese Lookout with magnificent views of Ipanema and Copacabana beaches, Guanabara Bay and Sugar Loaf. During the tour, guests can casually observe tropical animals like monkeys, sloths and exotic birds. On the way back to the hotel, we will stop at the Pepino Beach to watch the hang gliders fly through the air. Overnight Stay at the Hotel in Rio de Janeiro. Petropolis Tour: the city is located in the Serra dos Orgaos, and is only one hour from Rio de Janeiro. There we will stop at the Imperial Museum, which served as the summer residence of the imperial family during the 19th century. Visitors can view various historical pieces such as the scepter and crown of Emperor Don Pedro II, historical documents, imperial jewelry and the priceless pieces of art that belonged to the imperial family. During our tour we will visit the Crystal Palace and the São Pedro de Alcantara Neolithic Cathedral. Cruise on Guanabara Bay (only SIB): On 1st January, 1502, a Portuguese squad commanded by Gonçalves discovered Guanabara Bay. Being that it was the month of January and that the bay appeared to be a large river mouth, he named it Rio de Janeiro (River of January). Guanabara Bay is the largest bay in the world based on volume of water, and has several islands such as the Governor’s Island, Fundão and Snakes Island. In the west, you will see Rio de Janeiro, and facing east – the municipal district of Niteroi. 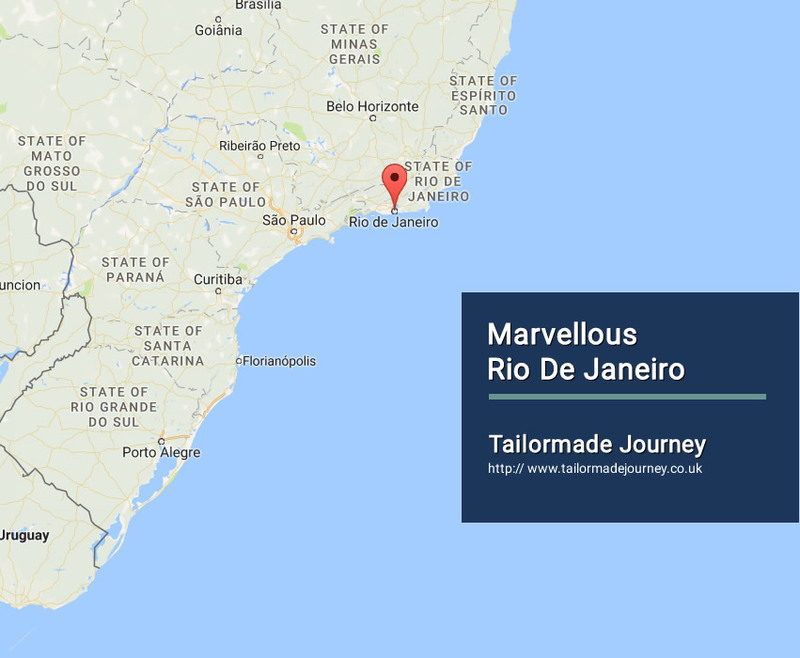 Various sights and landmarks will be seen as we depart from the Marina da Gloria by saveiro (schooner), such as the neighborhoods of Botafogo, Flamengo, Urca, Sugar Loaf, Fort São Joao, Flagstone Island, Santa Cruz Fortress, Rio-Niteroi Bridge and more. Transferred to Rio de Janeiro Airport to board flight for Onward Journey. PortoBay Rio Internacional features a restaurant and a bar with bossa nova music. Guests are invited to appreciate exotic drinks while admiring Rio de Janeiro's sunset. All rooms offers WiFi. Situated right on the beach, the 4-star hotel has rooms featuring sea views. They include flat-screen cable TV and minibar, as well as a 24-hour room service. Some rooms boast panoramic views and others feature a private balcony. The hotel also hosts Bar Limone, specialised in exotic fruit cocktails. The hotel provide beach towels, parasols and chairs. With international and Brazilian cuisine, La Finestra restaurant offers a rich buffet breakfast comprising fresh fruits, natural juices, hot and cold items. Health eating options are also provided. Lunch and dinner are à la carte. PortoBay Rio Internacional is within walking distance from popular bars, shops and restaurants. Cardeal Arcoverde metro station is 550 m from the hotel. Beach Volleyball Arena 800 m away, and Santos Dumont Airport is at a distance of 7.8 km.